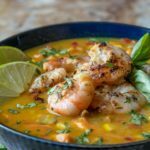 A delicious and hearty chowder kicked up with curry and topped with yummy cilantro lime shrimp. Saute bacon in a medium pot until slightly brown and fat has been rendered. Add onion, garlic and red pepper. Cook until soft. Add corn, sweet potatoes, coconut milk, broth and curry powder. Bring to a boil, reduce to simmer until potatoes are tender. Serve with cilantro lime shrimp. Blend all ingredients in a medium size bowl except shrimp. Add shrimp to bowl and marinade for about 15 minutes. Saute shrimp in pan 1-2 minutes on each side. Serve on top of curry corn chowder. In order to make the chowder vegetarian, omit the bacon and shrimp. The shrimp can be skewered and grilled. Serve on a salad, rice or quinoa for another meal idea.